In April 2016, Singapore-headquartered DBS Bank Ltd launched a banking app in India with in-built artificial intelligence (AI). In the past few months, many large banks such as ICICI Bank Ltd and HDFC Bank Ltd have also been looking at introducing AI technology in various services, including retail banking. Many of these are in the pilot or testing phases. The financial technology (fintech) space in India, too, has geared up towards AI and has seen interest from investors. For instance, Ratan Tata, chairman emeritus, Tata Sons Ltd, invested an undisclosed amount in Niki.ai, run by Techbins Solutions Pvt. Ltd, a start-up that offers chatbots to perform transactions. A chatbot is a computer programme that can conduct conversations. Niki.ai is an AI-fueled smart-purchasing assistant company. According to a paper by Stanford University’s John McCarthy, one of the founders of AI, it is the science and engineering of making intelligent machines, especially intelligent computer programmes. Simply put, AI is a technology of making machines over time learn from actions and take decisions for you. The machine is able to do the job of a human without any manual intervention. “The field of AI is changing fast. Advanced machine learning algorithms are composed of many technologies (such as deep learning, neural networks and natural-language processing) used in unsupervised and supervised learning that is operated guided by lessons from existing information. Machine learning is only one of the many AI technologies. Others include robotics, knowledge discovery, natural language processing and advanced vision,” said Rajiv Anand, executive director (retail banking), Axis Bank. Though AI has been around for a while, adoption in financial services is taking place now. “This is evolution of the digital story. Processes have got automative and AI can be used in places where you have to take a decision and recommend products. Banks have also started rolling out pilots. The concept of AI is not new. For instance, 10-15 years ago it was used in logistics. The starting point for AI is an algorithm where it looks at human judgement and then learns from experience,” said Vivek Belgavi, partner, financial services–fintech and technology consulting leader, PwC India. What is prompting AI usage in financial services? “The current digital wave in banking, fintech’s approach to low-cost products, and the open source system and accessibility is bringing AI to the forefront,” said Belgavi. AI can be used for basic processes and to build scale. “Right now, AI is available in a simplistic way. It promises scale and can do a basic element of interaction,” said Nitin Chugh, country head, digital banking, HDFC Bank. It is early days for AI in financial services in India. “In BFSI (banking, financial services and insurance), they have not adopted this technology (yet). These are still early days,” said Mallinath Sengupta, chief executive officer, NextAngles, which uses AI to help banks in compliance monitoring. As of today, globally, financial services are looking to use AI for compliance, anti-money laundering and risk management. “We are focusing on regulatory compliance, anti-money laundering and liquidity risk. For instance, you can’t sell derivatives to senior citizens because they are conservative. The machine will be able to tell which product can be sold and to whom,” said Sengupta. AI can be used extensively in customer service. “For instance, many European airports are using virtual customer assistance at airport gates,” said Sengupta. In this, 3D holographic images of persons in uniform aid passengers passing through security, and the UK border and international arrival gates. Fintech companies are also developing apps. “There are various user content that you can build an AI chat application on or just to look for information. We have built something that a user can use for inputs. AI is a mix of two things—understanding by human language and taking decisions,” said Sachin Jaiswal, founder and chief executive officer, Niki.ai. “For instance, Google search engine can’t have a dialogue. Facebook can take cognitive decisions based on patterns and algorithm. Largely speaking these are two different applications,” said Jaiswal. Banks may look at using AI for transactions, security and assistance. “A bank can use AI for authentication in transactions, access to buildings and specific floors and rooms, security for public safety and surveillance in locations including ATMs, interpersonal recognition and virtual personal teller assistants (for example, advising tellers of a customer’s identity without the customer having to do anything),” said Anand. 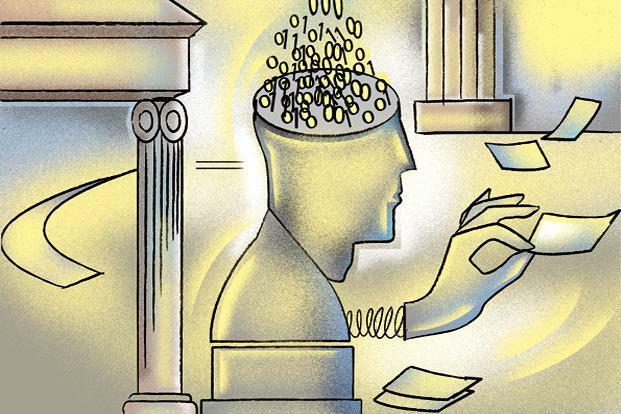 Virtual customer assistance is a vertical where banks will use AI to engage in natural-language dialogue in text or speech, learn from interactions, offer suggestions tailored to the customer and sense customer emotions and act accordingly, said Anand. AI can also be used for virtual personal assistants. The machine will observe content and behaviour, build and maintains data models from which it will draw inferences about people, content and contexts, predict user needs, and act autonomously on the user’s behalf. As of now, companies use data analytics for this purpose. With AI, the machine will do an end- to-end job. For payments, AI can also complete the transaction. Many fintech firms are working with banks to provide this. “We are working with HDFC Bank. Our idea is to build a unified form of transaction. The application is available for free. The revenue model is we make money per transaction. Depending on the kind of transaction, the cost can vary from 2%-10% of transaction amount,” said Jaiswal. Intuitive and personalised customer experience is one of the benefits that AI can provide. “Today when customers walk into our branches or call on the phone, we do not have the ability to recognise them by sight or voice. We don’t know their name and can’t anticipate why they are there or how to serve them best. AI will be able to enable such customer experience. Robotics and intelligent process automation will enable us to provide real-time products and services to customers by bringing down the turnaround time and associated process costs significantly,” said Anand. With the use of AI, banks’ call centre work could get reduced to a certain extent. “The banks will let KPOs (knowledge process outsourcing) and BPOs (business process outsourcing) handle less work. All the lower-end work of BPOs will get automated,” said Sengupta. But when you are using AI for regulatory compliance, intervention is needed. “You can’t replace that. In regulatory compliance, you can’t close the case without someone to look at it,” said Sengupta. “We have already tested AI-based chatbot for enquiry. AI will work because of its consistency, convenience and easy usage in omni-channels,” said Chugh. HDFC Bank plans to roll out more AI-based services by the end of this financial year. AI will change how interactive voice response (IVR) works for banking. An AI-based programme may offer a solution that’s better and comes faster. It will also extend to your bank’s website, Internet banking and mobile banking.